Harvard professor David R. Williams shares insights about how experiences of discrimination are powerful predictors of health, the origin of the segregated regional conferences in the United States, and both the positive and negative aspects of religious involvement. Question: You recently gave the keynote address at a conference at Andrews University. What did you talk about? First, I discussed the body of work on early childhood stressors and their influence on health. It’s quite striking to see how much early experiences influence our later lives. And what happens pre-natally also matters. One of the most striking areas of research is on pre-conception stress; the stress that occurs in the life of a woman even before she becomes pregnant has implications for the life of a child. A study from Scandinavia indicated a 50% higher risk of infant death linked to mothers who had high levels of pre-conception stress. In this study, the measure of stress was not comprehensive — it looked at women who experienced the death of an immediate family member before becoming pregnant. My point in the talk was that this research on early childhood adversity is a call to the church to be much more involved in parenting and providing parenting resources. This is important not just for local members, but also for our communities. There is enormous scientific awareness of the effectiveness of parenting classes, and programs that seek to enhance early childhood development. We also need to think of ways in which we can improve outcomes for children by improving the lives of their parents. This is where our churches could meet an important societal need. I spoke about the prophet Malachi, ending the Old Testament with the promise that God will send Elijah the prophet. And what would be the work of Elijah? “To turn the hearts of fathers to their children and the hearts of children to their fathers.” We claim to be this Elijah movement. How well are we doing the work of the Elijah? The second area I covered was the area of research on discrimination and health. We now know that experiences of discrimination are powerful predictors of health — even much more than I would have thought. Many studies show this. One measure of discrimination that I created is called the Everyday Discrimination Scale. It captures minor indignities: instances of people simply treating you with less courtesy, or acting as if you aren’t smart, or as if they are afraid of you. You receive poorer service than others in restaurants and stores— basically you are offered less dignity and respect. In developing the scale I drew on qualitative descriptions of experiences of discrimination that were present in the work of a Dutch scholar, Philomena Essed and an American sociologist, Joe Feagin. The Everyday Discrimination Scale is now used globally and has been found to be a powerful predictor of health outcomes. Research finds that high scores on this scale is an independent predictor of early death. And high scores also predict increased risk of heart disease, high blood pressure, diabetes, abdominal fat, and many other health outcomes, including babies being born low birthweight. I developed these measures trying to capture stressors faced by racial and ethnic minorities. And research shows that although stigmatized populations report higher levels of these experiences, these experiences are commonplace around the globe. The scale has been used in Europe, across many different populations, as well as in the US, Asia, Australia and Africa. The reason for the discrimination (race, gender, religion, sexual orientation, being an immigrant) does not seem to matter — what matters is the experience of the discrimination itself. The lesson for us is that the way we treat each other on a day-to-day basis has important implications for health. Each one of us can be an agent promoting wellbeing and good health, or an agent of death — just in the way we treat other people. The third area I talked about at Andrews was the evidence documenting the serious challenges posed by high rates of mental disorders. This is true in the US, as well as in a national study that I directed in South Africa over a decade ago. One in five Americans have had a case of clinical depression by the age of 20, for example. Mental disorders are very common, and are as — or more — disabling than many common physical disorders. For instance, mental disorders are the number one cause of missed days from work. And this is a huge group of people. In the 2010 US Census, only 31% of adult whites had a college degree or higher education. Thus, large segments of the U.S. population are experiencing high levels of stress linked to financial challenges and much less economic success than expected. Here is an opportunity for ministry. We need to think of ways that we can minister to this population. What if every local Seventh-day Adventist church was an oasis of emotional support and a center that enhanced community mental health and wellness? A second group with very high levels of suicide, and elevated risk of multiple mental disorders, are people who identify as LGBT. This is linked to how heavily they are stigmatized and marginalized in society. Many Adventists have a knee-jerk negative reaction to the LGBT population. More than a decade ago, I asked the teenage Sabbath School class that I was teaching at my local church whether homosexuality was a worse sin than adultery. They all said Yes. Every single one of them. We have some real prejudices. Many members of the LGBT population are experiencing emotional pain and they should experience the love of God in the way that individuals who claim to be Christians relate to them. Please tell us more about your research, beyond your presentation at the Andrews conference. There is a large body of work on religious involvement in health, and I am a contributor to that research. Research finds that higher levels of religious involvement tend to correlate with better physical and mental health. The strongest scientific evidence indicates that individuals who attend religious services frequently live longer than those who don’t. A national study of high school seniors in the US found that students with a high level of religious engagement do better than their non-religious counterparts on every measure of health risk for teens. They are less likely to bring a gun to school, smoke cigarettes, use marijuana or drink while driving. And they are more likely to wear seatbelts, get enough sleep and eat breakfast and lots of fruits and vegetables. Churchgoers tend to gain positive emotional benefits, as religious congregations can often be an extended family and a major source of support. It has been found that not having social contact with others is as bad for your health as smoking. The research also indicates that while overall religion has a positive net benefit for health, there are conditions where it can have a negative effect on health. Some studies in the US have found that the frequency of church attendance is linked to an increased risk of obesity (I call this “the church potluck effect!”). And while social relationships often give positive benefits, social relationships can also have negative effects. Research finds that when fellow church members are critical, and demanding that has negative effects on health, and the negative aspects of social ties are stronger than the positive aspects. Something called “religious coping,” or how people deal with stressful experiences, is another example. Many Americans turn to God for strength, support and guidance and research finds that this can be health enhancing. But negative religious coping can also occur. For example, when people deal with an illness or crisis by assuming that God is punishing them for their sins or lack of spirituality, or that God has abandoned them, this predicts much worse health. Negative religious coping is related to slower recovery from illness and earlier death among patients with cancer and other terminal illnesses. So while religion can be a positive resource, it can also be negative. A final example is a large body of scientific research that shows that religious people in the US are more intolerant and more prejudiced than the non-religious. A book, published in the 1970s that summarized the research evidence on religion and racial prejudice was titled, “The Bias and the Pious.” The more religious you were the more likely you were to be racially prejudiced. Some researchers went back to this finding and made a distinction between intrinsic religiosity and extrinsic religiosity. Intrinsic religion describes religious involvement that is personally meaningful, integrated into the core of a person and drives their worldview. It serves as a central motivating force that affects all aspects of life. Extrinsic religiosity is utilitarian. It is rules-oriented and legalistic. Extrinsically religious people seek to obtain external benefits. They want to be a part of the community, and for their neighbors to think of them as moral and good. But religion is not deep and meaningful for them. The researchers found that it was the extrinsically religious people who tended to be prejudiced. Intrinsically religious people were actually less likely to be prejudiced. More recent research continues to find that religious people are more likely to be intolerant and prejudiced. This research indicates that it is a “fundamentalist orientation” that predicts intolerance and prejudice. This is defined as a rigid, close-minded worldview in which people are convinced that their beliefs are absolutely correct. They have no flexibility and manifest a rigid worldview. When I speak to Adventist audiences about this I say that yes, we need to know what we believe and be strong in our commitment to the truths of God’s word. But deep within the Adventist psyche is the belief that we need to grow in grace, we have lots of lessons to learn, and truth is progressive. Having stood for hours on the floor of the General Conference session in San Antonio waiting to speak [on the ordination of women], it was striking to me the extent to which the leadership of the church has failed to educate our members on how to interpret Scripture. I heard so many people quote scriptures that did not apply to the question at all. We pride ourselves as having a resolute commitment to the word of God. But the inability of many of our members and church administrators to apply basic principles of Biblical interpretation and the level of misinterpretation among Adventist church members is quite striking to me. What did you say on the floor of the GC session in San Antonio? I did not get a chance to speak. In every other vote at the GC Session, people spoke in the order in which they stood. For this issue only, the meeting chair claimed they wanted to have balance. Accordingly, each person indicating a desire to speak was required to indicate whether s/he was for or against allowing regions to decide whether or not to ordain women, which then determined your priority on the list of persons waiting to speak (although the vote was to be by secret ballot). Then, every speaker who spoke in support of women’s ordination had to be followed by a speaker who spoke against it. Because more individuals rose to speak “in favor” of ordination, many of us who were in support of ordination never had a chance to speak, while all persons who rose to speak against it (including those who indicated a desire to speak after I had been standing in line for over an hour), got a chance to speak. No other discussions during the session were organized in that way. I attend the Waymark SDA Church in Boston. When I moved to Boston, I searched online and found 64 Adventist churches within a 25-mile radius, and 44 within 15 miles of my residence. And you said you teach the teen Sabbath School? That seems like an important, and difficult, job. Yes, I still teach a teen class. A lot of people are intimidated by this age group, but I love interacting with the youth. I don’t think of it as a tough to teach teens. You have warned about ethnic inequities in health. Why are black people more likely to age more quickly than white people? Why is race a factor in health? In race-conscious societies globally, race matters for health. In Brazil, the US, New Zealand, Australia, the UK, South Africa, and the list goes on — in every country where we have data, disadvantaged racial communities have a lower socioeconomic status (SES is based on income, education, occupational status, wealth). And, globally, socioeconomic status is the biggest predictor of health. People with higher levels of income and education live longer and have fewer health problems than their lower socioeconomic status counterparts. This pattern is found virtually everywhere. This pattern is also evident for blacks and whites in the United States, with the gaps in health within each race by income and education being larger than the black-white gaps in health. However, research has found that even after you take income and education into account, there is still something about race that matters for health. At every level of education and income, blacks in the U.S. have worse health than whites with similar socioeconomic status. For example, in national data for the U.S., a white person who drops out of high school lives three years longer than a black person who drops out of high school, and the gap widens as education increases. In fact, an African American with a college degree or more education has lower life expectancy than a white person who has only graduated from high school. The data are complicated. Yes, income and education predict health, but there is something about race that matters even after you have taken income and education into account. One of my areas of research has been unpacking what else there is about race that matters for health after we have taken income and education into account. So I have been studying the ways in which racism shapes access to opportunities in society, which play a role in determining access to resources, levels of stress, and risk factors which have consequences for health. New studies from other countries are confirming that a disadvantaged racial group has worse health, even for people with similar income and education. Adding a measure of discrimination to the statistical model explains much of the difference. Experiences of discrimination are stressors, which contribute to negative health outcomes. Have you done any specific research studies of the Adventist population? I was initially a part of the research team of the Adventist Health Study-2 out of Loma Linda University, but I am not currently actively involved. I was also part of a team of external scientific advisors to the Adventist Religion and Health Study, a research study examining the role of religious involvement in a subset of adults in the Adventist Health Study-2. I have also been involved in multiple national health studies of the US population, but there are too few Adventists to do separate analyses of them in these population-based studies. You wrote an article about regional/segregated conferences for the Adventist Review in 1997. Has anything changed in the intervening years? Do you think any inequalities are growing? Or decreasing? In the US and elsewhere, Adventists have had a sad history on race relations and although we have made steps in the right direction, there is still much work to be done. On the question of race, we have conformed to the world, and have often failed to rise to the demands of the gospel message. For example, in the 1940s black Adventists were shut out of most Adventist institutions (e.g., schools, hospitals, campgrounds); just as blacks were excluded from institutions in the larger society. (Southern Adventist University, for example, did not accept black students until 1968). Back in the 1940s black ministers could attend a meeting at the General Conference in Maryland, but when ministers broke for lunch, white ministers could go next door to the Review & Herald cafeteria, while black ministers had to go down the street to a “colored only” lunch counter to be served. Let’s consider how regional conferences got started. In 1943 a (light-complexioned) black couple went to the Washington Sanitarium for treatment when the wife got sick. This Adventist hospital initially accepted her as patient, but when her husband indicated that she was black as he filled out the paperwork, the hospital indicated that the staff had made a mistake in admitting her since the hospital did not provide treatment to black patients. Sister Lucy Byard was taken out of her hospital room while the Sanitarium staff called around to other hospitals to identify one that would treat her. Shortly after, she died of pneumonia. The black Adventist community believed she had contracted this pneumonia while waiting for hours in the hospital hallway wearing only a hospital gown. A number of prominent lay black SDAs formed an organization and presented a number of demands to the General Conference president. The demands were not for black conferences but for equal treatment in the SDA church. They were calling on the General Conference to act to ensure an end to discriminatory and inhumane treatment of the black members of the church. In 1944 the General Conference called a special meeting as a part of Spring Council to discuss these demands. Many prominent black pastors were also invited. In the discussion, a GC leader proposed separate black-run conferences as a solution to the problem. The laypeople whose demands had triggered the meeting were opposed. They were calling for equality within the church. But the black ministers (who had been shut out of leadership positions) did not fight it. And that is how regional conferences (the euphemism for black conferences) got started. Which still exist. Interestingly, many historic white conferences are no longer predominantly white. Many of them are very diverse. But we still maintain these separate overlapping, inefficient structures that were originally based on race. It is a problem. It makes sense from a historical and sociological perspective given the reality of racism in contemporary society. But it is not defensible theologically and it is a gross distortion of the gospel. We want to sweep this under the rug as if it is not a problem, but it is. Three times in John chapter 17, Jesus pleads for His followers to be one as He and the Father are one. And Jesus declares in that this unity is necessary that the world will “believe” (verse 21) and that the world may “know” (verse 23) that He was sent by the Father. Ellen White responded to a proposal to establish separate conferences based on nationality in Europe by saying that the idea violates John 17. She said that the principle of unity in Christ must be mirrored in conference structures, and that “the strongest witness” to the gospel is when people of different backgrounds are working together. Dividing ourselves is misrepresenting the Gospel and maintaining the status quo is declaring that true, meaningful racial reconciliation such as the world has never seen is a nut that is too hard for the gospel of Jesus Christ and the Holy Spirit to crack. Our membership is changing. Our church is not growing well in the NAD, except among immigrants. And we are in denial. This is not all ancient history. I served on the board of Atlantic Union College from 1991 to 2008. Why did AUC close? I would argue that AUC experienced a dramatic decline in the enrollment of white students as the numbers of black students increased. And while the black enrollment increased it was not sufficient to overcome the exodus of white students (which decreased from about 70% to 10% during my time on the board). Independent focus groups among white parents of potential AUC students, commissioned by the college early in my tenure on the board, found two reasons why they were not sending their kids to AUC: 1) they felt AUC was not spiritual enough, and 2) they felt their children were at ages when they establish romantic relationships and they were worried if they sent them to AUC they would come home with a black partner. Sociologists call this the tipping point: across a broad range of institutional contexts in American society, when the black population reaches somewhere between 10% and 30%, the white population leaves in droves. What this tells us is that we as spiritual leaders have failed to educate and challenge our members on the subject of race. We cannot run indefinitely. We have to find ways to work effectively together. I have spoken to both white and black SDA groups on the question of racial unity. The fundamental mistake people make is to envision the closing of black conferences and having them join the “white” conferences as the solution. No. Regional conferences are not the problem. They are merely a symptom of racism within the church. We need to close all the current conferences and build new ones based on new principles. Of course, many church leaders are politicians and nobody wants to lose their own position. But our current system is an accommodation to racism. We need to develop new systems built on principles of equality, openness, and working together. In the Atlantic Union, there is serious consideration of restructuring the current regional conference into two. But we would still maintain the inefficiencies linked to two conference structures overlapping the same geographic space. We should really dramatically restructure in 2018 and eliminate the legacy of racial barriers established in the 1940s. It is important to note that this problem of the lack of unity in conference structures is not confined to the US and South Africa. Across the globe, we are proliferating church structures based on ethnicity and nationality. We are creating structures that enable our members to bask in their ethnic or national pride. This can cause a distortion of the gospel message and what God is calling us to do. I have recently read America’s Original Sin by Jim Wallis, the editor of Sojourners, a progressive religious magazine. It’s a book about racism within our society and the Christian church, and how he as a white person is grappling with it and calling all Christians to a more authentic faith. I have also been reading Roy Adams’ Beams of Heaven Guiding Me. The first half could have been published by the Review, as he recounts God’s leading in his life. But in the second half he details, with dates and names, as church leaders looked for the next editor of the Review and bypassed him, even though he was the most qualified candidate for the job. This is a place to really see the church’s underbelly and political maneuverings. Adams says: “If you think I am saying too much, you should see what I am holding back,” But he is not bitter. It’s a very sobering read — I wouldn’t recommend it to everyone. You need to be rooted and grounded in the Lord yourself — if your faith is in the church you might lose your way. I think students of church organization should be studying this book. It will concretely increase their awareness of how race plays a role. It is very sobering. 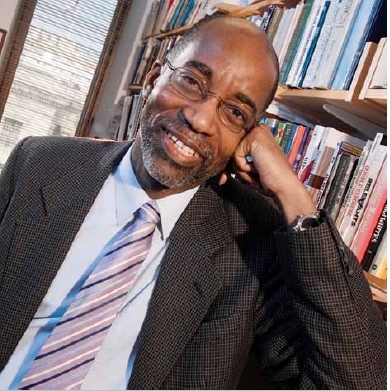 David R. Williams is a Harvard University professor in public health, sociology and African American studies. His research focuses on social influences on health. The transcript of a lecture by David R. Williams, which he has given on behalf of the GC's Education department, published in the Journal of Adventist Education. David R. Williams' TED Talk about racism, released in April 2017. Race Matters for Health...a Lot! Photo courtesy of David Williams.